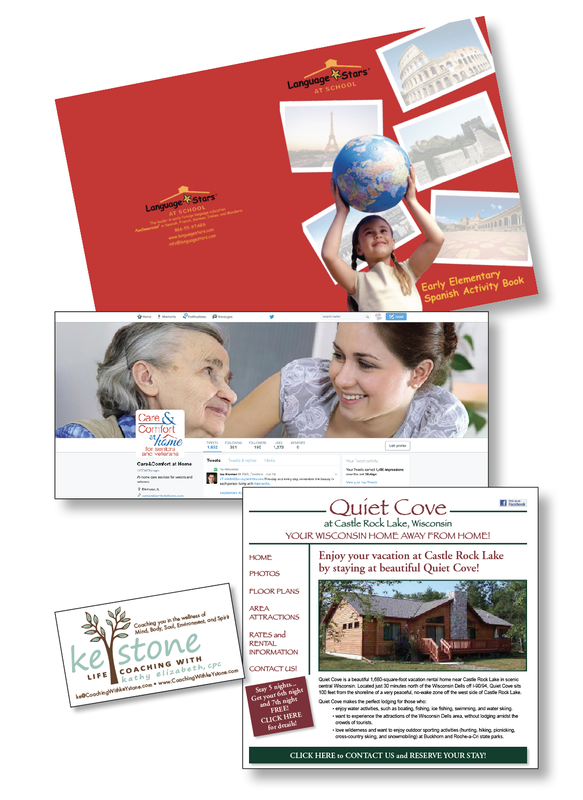 LaCroix Creative is your one-stop shop for all your creative marketing and publishing. law and health service professionals, and real estate agents. We work with small fish and big fish companies alike — from individual “soloprenuers” to well-established million- and billion-dollar corporations that operate on a global scale. But we haven’t forgotten our own roots, and as such, we’ve got strong a desire to see start-ups succeed from the get-go! you had, but thought you couldn’t afford. We’re the writers who create and deliver your message. We’re the editors that can help make your writing marketable. We’re the designers that bring your vision to your market. You’ve got something to say. We’ll help you say it. Why go to two, three, four or even more creative service providers? LaCroix Creative gives you all the creative services you need, in the most integrated and cohesive way possible, from just ONE provider. Our branding services are complete and comprehensive, to help you build an identity that people know, like, and trust. Even in this digital era, print is still relevant. 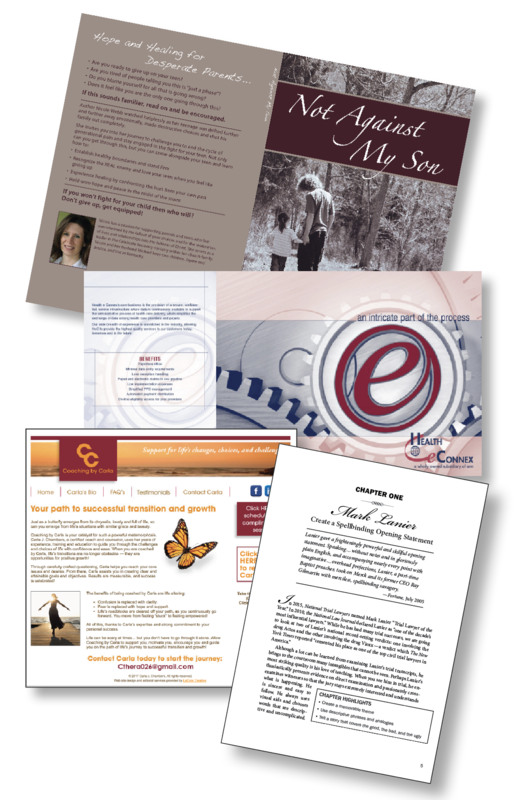 We produce outstanding print publications to answer the call. We take your creative project from concept to completion — and beyond! Learn more about our creative services! And now… Offering do-it-yourself creative content PRODUCTS! Check out our first offering — the LaCroix Creative DIY Facebook Content Bundle! Shop for DIY creative products! Click on the client’s name to see the project we created! Patricia was a consummate professional and a tremendous pleasure to deal with. Always on time or ahead of schedule, completely focused on the quality of the design and its alignment with my vision, and cheerfully adaptive to (quite a few) changes in direction from a first-time author. Pat was always pleasant, upbeat, even-keeled, and focused on delivering the best results for her client. I could not have asked for a better experience. Patricia created the interior design for my litigation textbook, Turning Points at Trial (562 pages). The text required a lot of attention to detail as there were trial transcripts, call-out boxes, numerous headings, chapter checklists, and highlighted practice tips. Patricia was able to turn the text into a beautiful book that was clear, crisp, and easy to read. This was no small feat! Patricia was always response to my needs, multiple edits, and questions. If you are looking for a book designer who can take a complicated text and turn it into a work of art, hire Patricia. She has tremendous expertise, is conscientious, and an absolute pleasure to work with. Patricia is highly creative, intuitive, and skilled in web design, launching, and writing. She is able to make her client’s visualization come alive on the screen. Patricia’s attention to detail and desire to meet deadlines makes her one of the best in her field. She is willing to work with you until you are 100% satisfied. She has worked on two projects for me, and I will use her again and again. I highly recommend Patricia LaCroix and LaCroix Creative. Thanks to LaCroix Creative, the website for our senior in-home care company went from nowhere to the first page of all the major search engines. Patricia keeps us on our toes with new opportunities to promote our website and our services. She has written and placed press releases for our company into several of the local papers. Patricia completely helped me get my business launched. She helped me in so many ways with my website and SEO. She brought up my website’s ranking on searches and gave it a fresh new look. My website is now on the first page of Google! Experience LaCroix Creative for yourself! Contact us for a FREE initial consultation. Sign up for our mailing list and get our FREE monthly newsletter! Every month, LaCroix Creative sends out a FREE newsletter, chock full of information designed to help our clients improve their businesses. We like to refer to it as news you can REALLY use! Plus, it's our vehicle for spreading the news about any discounts or specials we are offering. If you'd like to receive it, fill out the form today to sign up for our mailing list! We respect you and your information!